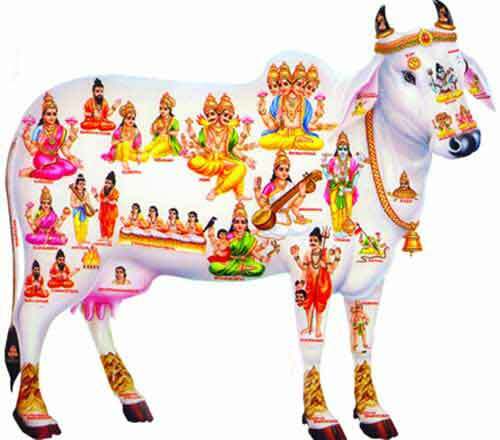 Indra once happened to see Surabhi, the Kamadhenu (divine cow), crying in the Indraloka. Indra asked her why she was crying. The story of Indra and Surabhi is found in the Puranas and there is also a famous Kamadhenu Stotram written by Indra. It is chanted for attaining peace and prosperity. Surabhi then described the troubles that her children are going through in the world. She told him that her sons were ploughing without rest. They were always tied to the yoke of farmers. She said that she was overwhelmed by their sufferings and tears rolled out from her eyes. Indra’s heart melted due to the tears of Surabhi. Indra then caused heavy showers in the world, when ploughing became impossible. Thus the sons of Surabhi (oxen) got rest in the world. There is also a famous stotra written by Indra praising the glory of Surabhi in the Prakruti Khanda of Brahma Vaivarta Purana. The stotra extols the glory of Surabhi by telling who all have worshipped her and the benefits of worshiping the divine cow.